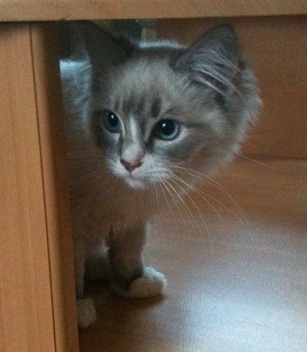 Brian and Helen are pleased to announce the arrival of ‘Marcus’, the ragdoll kitten! He’s the most beautiful, but also the naughtiest kitten in the world, doing a wall of death round the living room and up and down the curtains at regular intervals. Since he’s been here we’ve found that he has absolutely no fear of any dog. They’re all his playmates as far as he’s concerned. Our hearts have been in our mouths more than once or twice!